Lachtäubchen (Behr) "Polka de W.R."
Song, Op. 21 #5 "Lilacs"
Song, Op. 38 #3 "Daisies"
Waltz, Op. 18 "Grande valse brillante"
Waltz, Op. 42 "Grande Valse"
Adolph von Henselt: Etude caracteristiques, Op. 2 #6 "Si oiseau j'etais"
Camille Saint-Saëns: Carnival of the Animals: #13 "The Swan"
Song without Words, Op. 67 #4 "Spinning Song"
Concert Etude, S. 145 #2 "Gnomenreigen"
Schwanengesang (Schubert), S. 560: #7, Ständchen "Leise flehen"
Die schöne Müllerin, D 795/Op. 25: #2 "Wohin?" Partita #4, BWV 828 "Sarabande"
Ruins of Athens, Op. 113: #5 "Marcia alla turca"
Moritz Moszkowski: Etude, Op. 52 #4 "Jongleuse"
Les saisons, Op. 37b #11 "Novembre - Troika"
Song, Op. 16 #1 "Cradle song"
Spanisches Liederspiel, Op. 74 #10 "Der Kontrabandiste"
Sergei Rachmaninoff considered himself first and foremost a composer. The last two decades of his life, however, found him increasingly busy in his "second career" as a touring concert pianist. 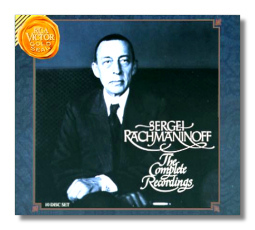 BMG, current custodian of the Victor back catalogue, has reissued all of Rachmaninoff's recordings as a performer, including his pre-Victor Edison discs, together in a ten CD boxed set, all newly remastered. Aside from his justly famous renditions of the Chopin Second Sonata and Schumann's Carnaval, the repertoire on Rachmaninoff's solo piano discs consists mostly encore length pieces that fit comfortably on one or two 78 RPM sides. This reflects not so much what Rachmaninoff wished to record as what his record company deemed saleable. What a contrast to the A+R agenda for Victor's British affiliate HMV, which included Schnabel's Beethoven complete Beethoven, the Bach 48 played by Fischer, and major Chopin and Schumann cycles with Cortot. It's a shame Victor didn't record Rachmaninoff in the large-scale works with which he triumphed in concert: Beethoven's Op. 111, Liszt's B minor and Dante sonatas, the Chopin Préludes, and so on. In addition, the record company turned down Rachmaninoff's suggestion to record he and Vladimir Horowitz playing his two-piano suites, as well as recording Rachmaninoff's final concert tour. On the other hand, Rachmaninoff's services did not come cheap. And once ensconced in the studio he could be a finicky recorder, waxing take after take until he got what he wished – reason enough for Victor's higher ups to proceed with caution. Small works or no, virtually every performance here attests to Rachmaninoff's powerful, sometimes overwhelming, recreative personality. His level of workmanship, well, pretty darn inhuman! Whose jaws have not dropped upon hearing his casual dispatch of Henselt's murderous double note étude, "Si Oiseau J'Etais". What other pianist manages the treacherous skips in the Scherzo of Chopin's Bb Minor Sonata with the same authority? And that powerful left hand and unfaltering rhythm. A tone that always sings, and aristocratic phrasing that enables him to shape melodic lines more tellingly than a lot of singers. Some of the pianist's unorthodox conceptions will unsettle modern listeners, particularly in regard his liberties with tempos, dynamics, and even note changes. As a child of the late nineteenth century, Rachmaninoff's playing embodied many of the stylistic traits common to pianists of his generation like Bauer, Lhévinne, and Hofmann. Under his disciplined hands, however, these so-called "Romantic" devices, including that allegedly "undisciplined" mannerism of breaking of hands, are channeled towards specific musical ends. His interpretive "whims" always sound inevitable rather than capricious. It may be heretical on my part, but I feel Rachmaninoff' played other composers better than he played himself. There's no questioning the authority he brings to his own works, but only in the transcriptions, the Paganini Rhapsody, and the first movement cadenza of his F# Minor concerto does the pianist really catch fire. But certainly the composer's steel-engravings approach to his Préludes and études- tableaux is valid, although Moiseiwtisch's deft watercolors, or the narcotic-like seduction of Horowitz in, say, the gorgeous G Major Prélude Op. 32, #5 should not be discounted. There can be no disagreement, however, about the composer's inexplicable cuts in the third concerto! The big ones in the third movement are bad enough, but why does he jettison my favorite passage, that sublime chromatic sequence eight bars before number 11 in the first movement? Conversely he conducts his Third Symphony and the tone poem, The Isle of the Dead, with surging brio and textual transparency- a refreshing change from today's overripe, elephantine performances. Ward Marston's transfers are generally superior to those effected in 1973 when this material was first gathered for reissue. The blaring distortion in the concertos has been tamed, although the orchestral image seems a tad more open and natural on LP. Subsequently, the remastered tapes were put through the Cedar Noise Reduction System – not by Marston but someone else. This results in frequent pumping sounds, making certain notes sound like they're being sucked up by a vacuum cleaner! Incidentally the missing side for the acoustic version of the Second Concerto ("replaced" on LP by its electrical counterpart) was located and is reinstated in its rightful place. But why were the approved "alternate" takes of Beethoven's Op. 30 #3 Violin Sonata, available on Biddulph, omitted from this collection? Moreover, the amount of music spread across these ten discs could have comfortably fitted on eight. Notwithstanding my editorial quibbles, no one who cares about the piano, or twentieth century performance practice can afford to be without this set. I envy young pianists who will hear these records for the first time.